Disney goes all out with decorations this time of year. There are Christmas trees in all the parks and resorts, specialty treats, and specialty merchandise. Another fun part of the holidays are the gingerbread displays at some of the resorts. A popular gingerbread display is the gingerbread house at Disney’s Grand Floridian Resort & Spa. This beautiful display is huge and nicely detailed, and it’s been a holiday time fixture since 1999. A lot of guests passing through the Grand Floridian’s lobby will stop and take a picture of the gingerbread house by itself or use it as a background for a festive holiday picture. 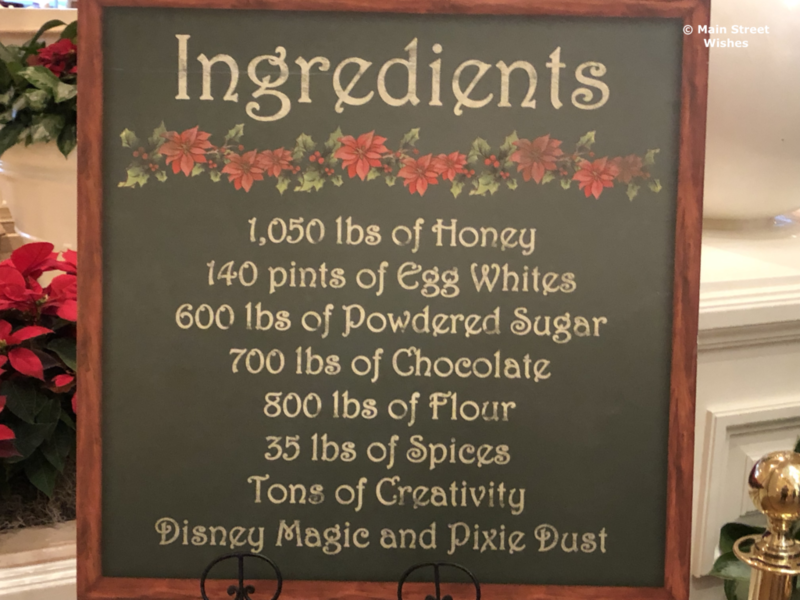 When you stop by the gingerbread house make sure to take a look at the ingredients list. It’s amazing how much goes into making this gingerbread house. It’s not surprising though, when you see the size of the house. The really fun part about the gingerbread house is that it’s not just a display. There is a window around the back of the house where guests can line up and purchase goodies. There are lots of delicious sounding things on the menu, so it can be difficult to make a decision. They do have menus available, so you can ask to see one of them. It’s helpful to have an idea of what you want before you get to the window, because the line can get a bit long, depending on the time of day. The hours of operation for the window are 10 a.m. to 10 p.m. daily. They also have non-edible items, like a gingerbread house mug. 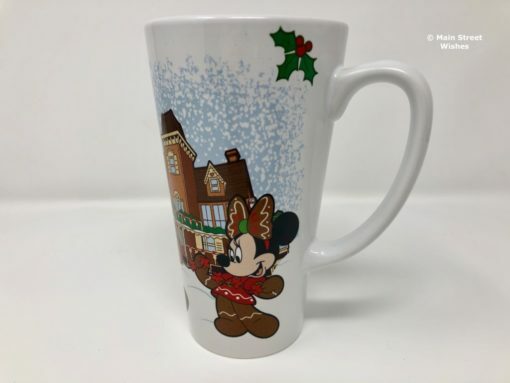 I brought one of these home, because it’s so cute! 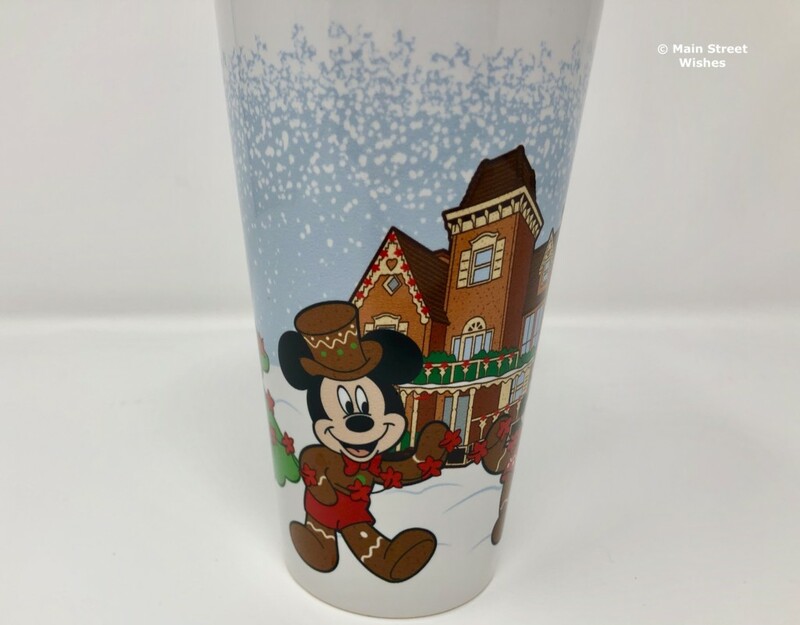 It has the gingerbread house on it and gingerbread Mickey and Mickey are helping to decorate. 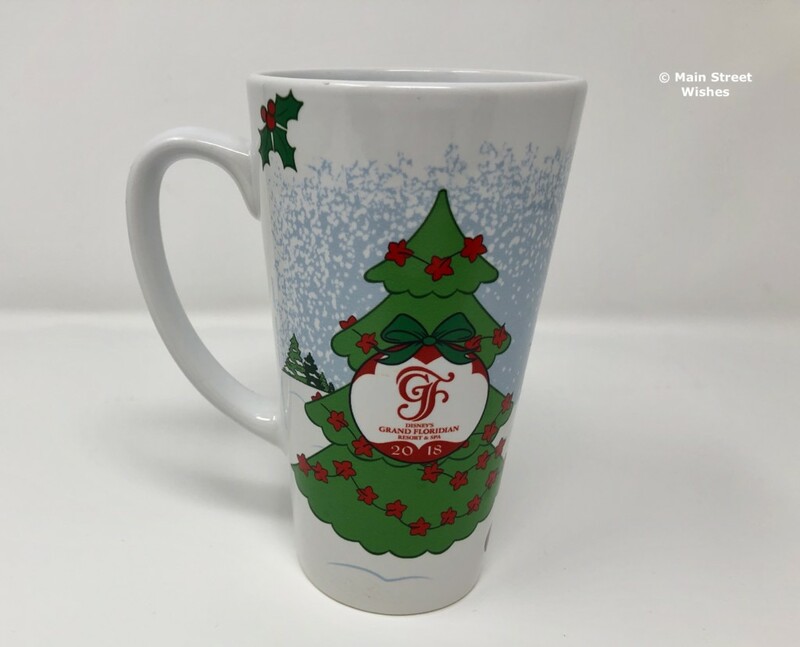 There’s also a Christmas tree with the Grand Floridian logo and the year on the back. 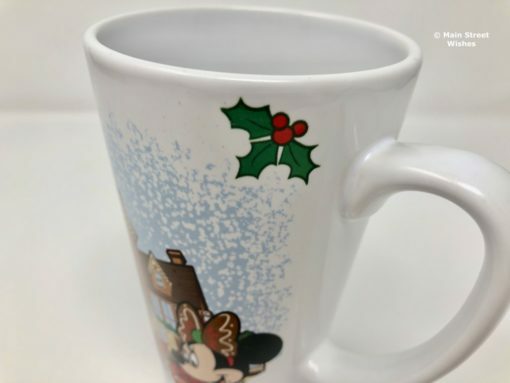 Take a look at the holly on the mug too, you’ll spot some hidden Mickeys. 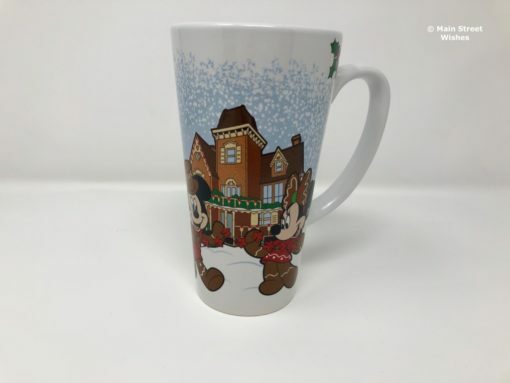 It’s a nice addition to anyone’s mug collection. 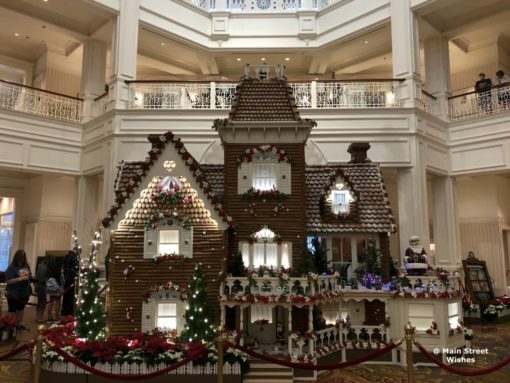 So if you are heading over to the Grand Floridian make sure to stop by the gingerbread house in the lobby. It’s really impressive to see in person! What’s your favorite thing to get from the gingerbread house? Liz the ginger bread house looks amazing I don’t believe it was up when I was at DISNEYWORLD November 9 through the 17 but I did see a beautiful gingerbread at the contemporary the one you’re showier looks larger.As always thanks for the info. I will be going to the World this week and it’s my first Christmas there ! I am so excited !! 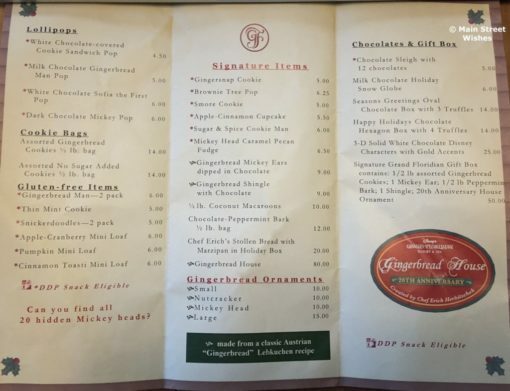 This is a wonderful suggestion, I will definitely be visiting the Grand Floridian Ginger bread house! I have a couple questions for you when do you suggest going to see it and what do you recommend from the gingerbread shop?Also, are the items there only located there or can you get them somewhere else? If you like gingerbread then I would try one of the gingerbread shingles. They’re the same shingles that are on the gingerbread house. The peppermint bark is another popular item from the gingerbread house. I’m not sure if the items are sold anywhere else, so if there’s something you definitely want to try, I would get it from the gingerbread house.